Real-time policy alerts, based on open-standards curated by open-source communities, allow analysts to rapidly triage network anomaly and security IoC events. With legends consisting of key packet capture and data compression statistics. The immutable ground truth of any critical event – not merely an interpretation. 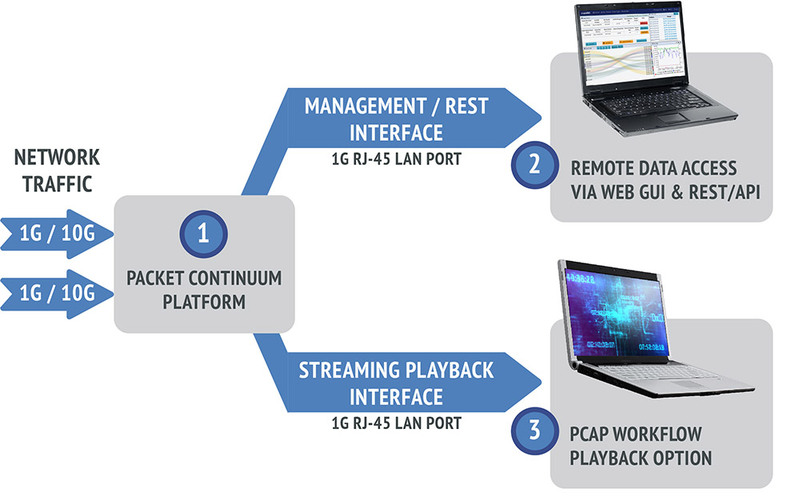 Packet Continuum provides a performance guarantee of sustained lossless capture rate, for a set of real-time packet analytics (Threat Hunting / Log Manager) functions, and a specified number of Packet Continuum cluster nodes. This means a deterministic guarantee to capture every packet under real world conditions, not just a “best effort” attempt. Packet Continuum simplifies your workflow by integrating endpoint behavior and network signature visibility and DPI with a simple pivot to the sessionized network data, enriched metadata and file recovery. Mitigate the nearly 2/3 of breaches per incident that are easy to catch, like administrative issues, by implementing effective, basic cyber practice policies by tracking user agent signature characteristics, email and file exfiltration. The Packet Continuum user interface (and programmatic REST/API) integrates Policy Management, Threat Hunting / Log Management, Forensic Investigation, and Open Data Access. 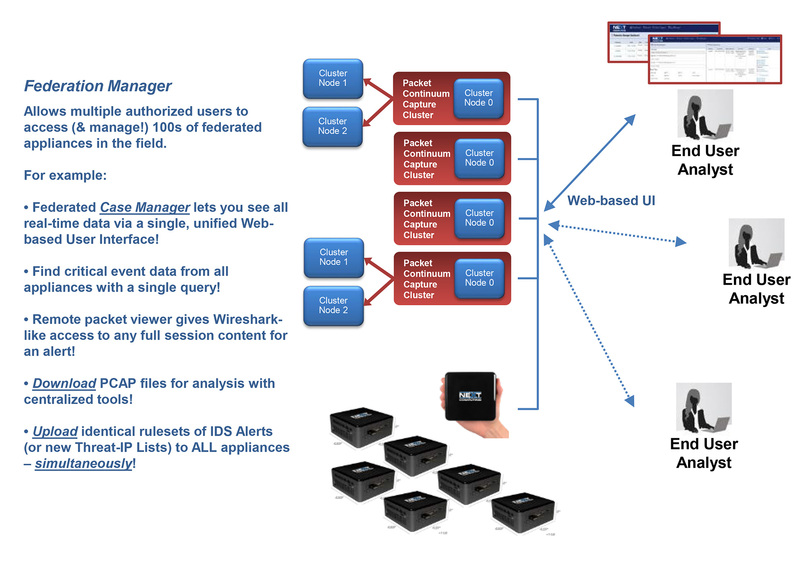 Triage critical events with real-time alerting policies. All policies generation logs/metadata which are compressed, correlated, and instantly searchable. 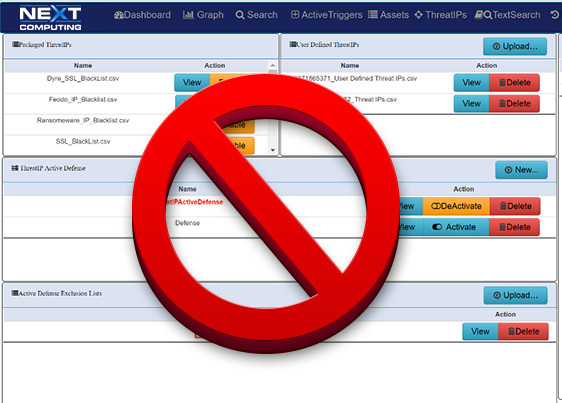 All policies integrate within a full-featured Threat Hunting / Log Management User Interface. Packet Continuum facilitates the “Spiral-Model” methodology for effective forensic investigations. Combine zero day alerting and pivot for analysis/mitigation and historical post breach forensics analysis including “cyber-espionage,” “point-of-sale intrusions,” and “privilege misuse.” Reduce the cost of network recording software and systems needed for medium and large networks. Reduce labor needed for identification of indicators of compromise with an easy process to pivot to sessionized data / enriched meta data and reconstruct email and files for review. Cluster architecture leverages CPU power over many servers for super-fast query response, while enabling low-cost local-attached storage on a massive scale. Forensic timelines smoothly scale over days, weeks & months. Packet Continuum’s Federation Manager allows you to federate multiple capture appliances in multiple locations. Federation manager dashboard for easy identification of Packet Continuum appliances/clusters that can even be in different physical locations. Your enterprise network can identify the IP address of each appliance and federate together for a single pane of glass view of all network data. 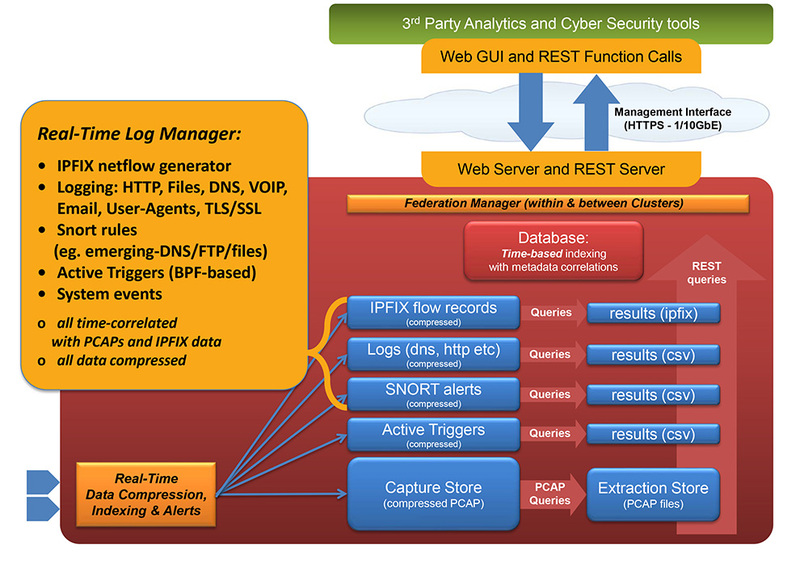 Federated search across PCAP data, DPI log data and flow records, as well as email text and files for reconstruction. Federated list of SMTP email sessions with time stamp, capture node location, session information, and SMTP email address, sender, and receiver. The user can click to obtain full session packets, extract email text, subject and reconstruct attachments in their original mime format, PDF, doc etc. Federated list of HTTP sessions with time stamp, capture node location, session information, and HTTP link summary and files. The user can click to obtain full session packets, extract email text, subject and reconstruct attachments in their original format. Packet Continuum MapReduce Architecture uses Capture Nodes and Cluster Nodes as the building blocks of massive scale. 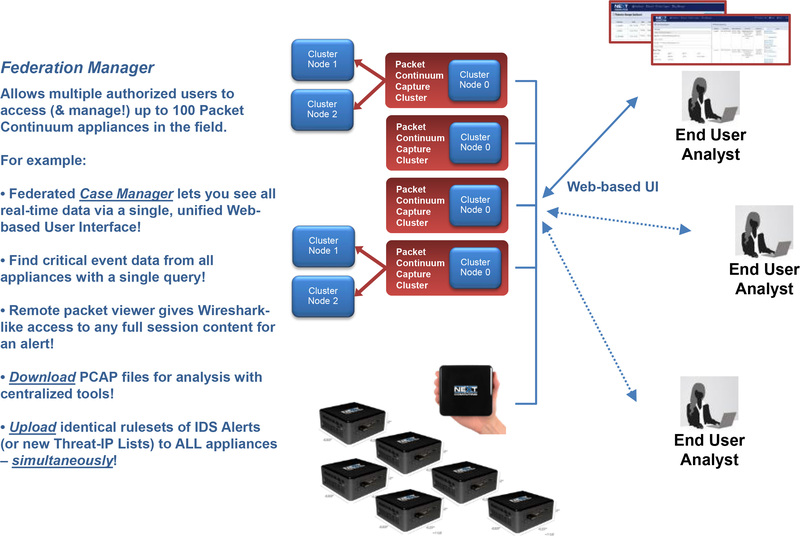 The following diagrams illustrate how to use Federation Manager for continuous lossless packet capture of 40Gbps and 100Gbps and even higher rates– including real-time IDS alerting (Snort/Suricata) running at line rate, together with other packet analytics and Policy Management functions. Each configuration uses the same core appliance as a “Node”: a Dell R730 enterprise-class server with 100TB storage specifically allocated for capture timeline, net of other storage requirements. 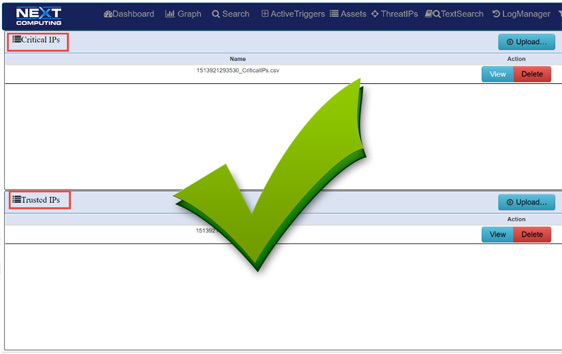 Every query has the option to return PCAP files, NetFlow records, and/or any log files. All results are streamed in “chunks”, allowing partial results to be analyzed while the remaining query is completed, the first of which appear almost immediately after the query initiates. Historical “look-back” queries based on standard Berkeley Packet Filter (BPF) within a time period. Active Trigger “look-forward” alerts, BPF-based and user-defined, can generate dozens of simultaneous alerts when the target condition occurs. Compatible with ANY 3rd party capture/analysis tool – just like a span/mirror port. Great for recording, additional packet/signature analysis, or back-testing new firewall policies against real historical traffic. Packet Continuum enables identification, monitoring, viewing, and mitigation of pre-defined Threat IPs as well as user-defined IPs. Packet Continuum comes pre-loaded with a known list of Threat IPs; a number of malicious IPs previously identified by trusted sources such as US-CERT, for your protection. When a Threat IP is identified as present in a session, the system generates a severe alert and a pre-defined Active Defense action can be executed or, if one is not available, alert info can be sent to an external server. Packet Continuum enables identification, monitoring, viewing and automatic approval of Defended Assets, which consist of Critical IPs (essential infrastructure) as well as Trusted Asset IPs (host IP addresses defined as safe). Similarly, Defended Services for each critical network application/protocol are defined by port #. Identify and search email strings and subjects. Email extraction feature includes sender, receiver, subject line and text reconstruction. Packet Continuum simplifies the email session logging process with pivot to sessionized search and file recovery. List of SMTP emails sessions searchable with time stamp, capture node location, session information, and SMTP email address, sender / receiver. A user can click to get the full session packets, extract email subject / text and reconstruct file attachments in original mime format, PDF, doc, etc. Search window based on selected sessions. Reconstructed JPG file displayed with the metadata file associated with that graphic image. Gain visibility into TLS / SSL encrypted sessions. Log and extract sessionized PCAP data via timestamp, capture node and session information for recovery of sessionized packets, then offload them to WireShark using customer provided keys. Packet Continuum’s open interface enables use of 3rd party commercial and open source tools from SIEM for additional cyber analytics. Log files and alerts viewable as CSV or text files in any compatible application such as MS Office. Open REST/API for creating custom workflows to automate Incident Response, Policy-driven data retention, or interface to legacy analytics tools. Packet Continuum dashboard integrates policy-driven IoC events for rapid triage decisions and simplified workflows. Packet Continuum has remote viewers for sessions, packets, IoC events, and even previews for detected files. Data can be viewed without external tools or downloading to the local system. Besides viewing, user also has the capability to create more concentrated and focused searches from the view data available. 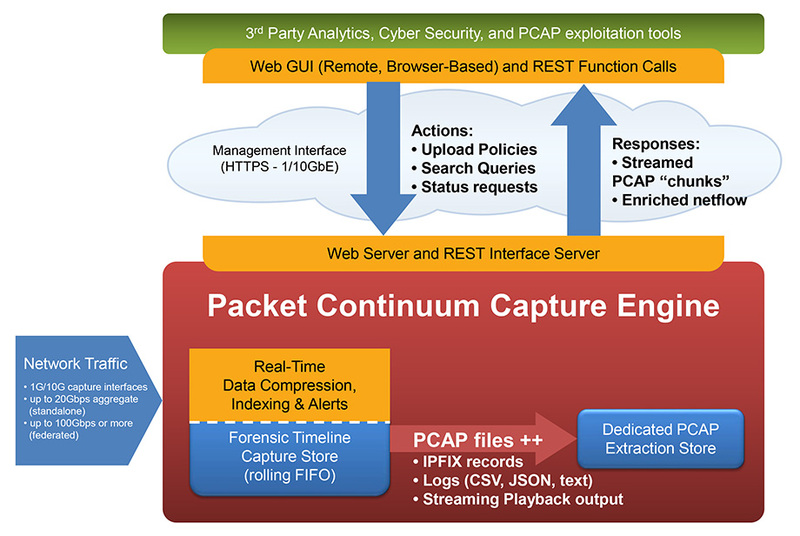 As an “Open PCAP Infrastructure”, the Packet Continuum supports even the largest enterprise-scale users. Lossless packet capture is the immutable ground truth of any critical event – not merely an interpretation. Take direct ownership of your own critical network data resource.